UPDATE: As of June 25, 2018, Zaycon Fresh has suspended operations. Read the details at the bottom of this post! The short version: Last year I bought boneless skinless chicken breasts from Zaycon Fresh and they were awful. 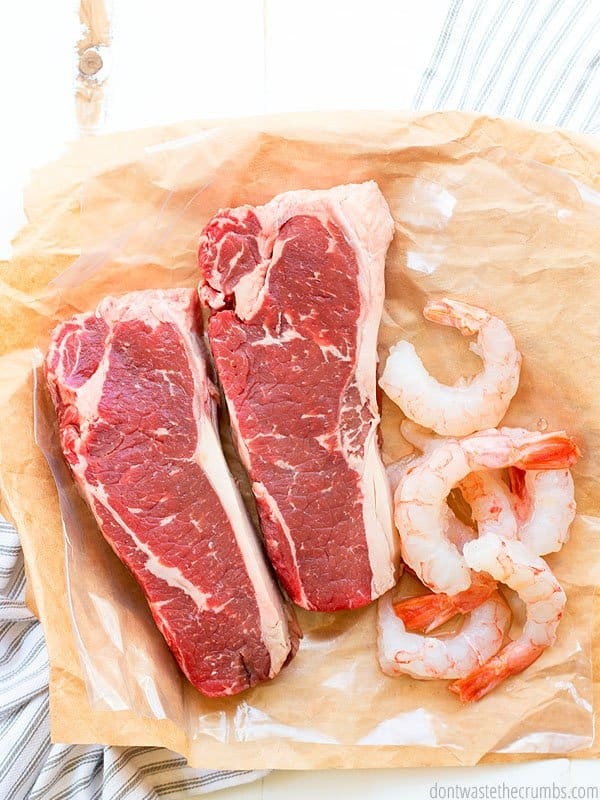 I contacted customer service, they gave me a refund via store credit and in turn I bought wild Argentine shrimp and Kansas City strip steaks. I told you guys I’d update you on that order when it came in, so here I am. This is my Zaycon Fresh review of their shrimp and steaks! Hang on. Let me take a step backwards for a moment. Have you ever even heard of Zaycon Foods? They are some of the pioneers of the “farm to table” movement, helping regular people like you and me get access to quality foods without spending a fortune. They do this by cutting out the middle man. Instead, they work with local farms, minimally process the meat (i.e. just so that we’re getting “chicken breasts” and not a live feathered chicken) and then sell the meat to us in bulk. Buying in bulk saves us money, and by working with the farms (via Zaycon) we don’t have to pay for shelf space, employee salaries or the electric bill for Kroger. 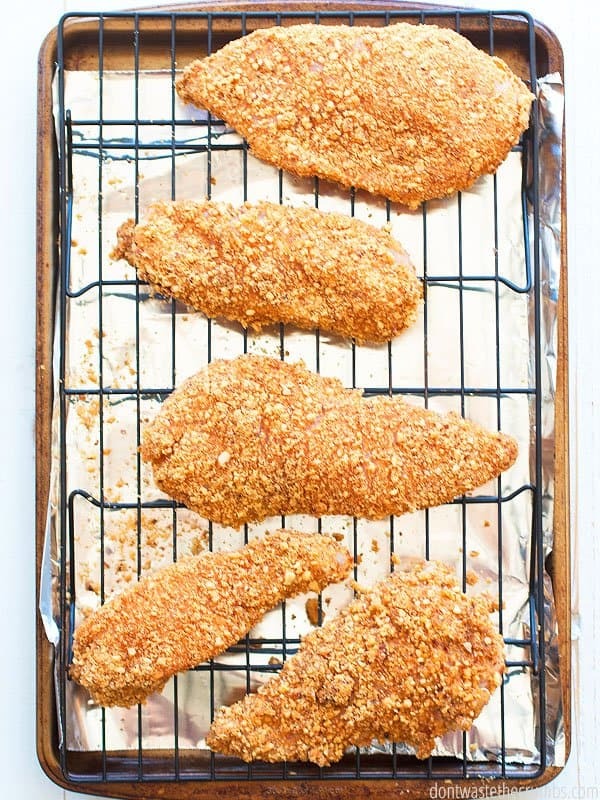 They’re most famous for their boneless skinless chicken breasts, which often go on sale for $1.88/lb. I repeatedly heard great things about them from people I trusted, and that’s why last year I gave them a shot. And as I mentioned, it was downright terrible. You can read the full experience in my honest review on Zaycon Foods, but in short, the meat was VERY tough and VERY chewy. For a point of reference, we’re used to eating certified organic chicken. I’ve had pastured chicken and conventional chicken in the past as well, but the chicken from Zaycon was unlike any chicken we’ve ever eaten before. There are 100+ comments (and counting) on my original posts, and while some readers mention that pastured birds tend to be more tough than non-pastured birds, the meat was so chewy that I happily signed up to cook a chicken-based meal for 24 people during a retreat last summer. Honestly, it was so that we didn’t have to eat all that chicken by ourselves. I contacted Zaycon Foods and told them of my disappointment, to which they gave me store credit. Not wanting to write off their company altogether – since I had really truly heard WONDERFUL things about their products – I reinvested the credit and purchased Kansas City steaks (i.e. New York strip) and wild shrimp from Argentina. Ok – now that we’re all caught up, let’s move on. 1. Visit Zaycon online. Shop by products OR shop by location. I think it’s more efficient to shop by location first, and then if you don’t find what you’re looking for, try searching by products. 2. Enter your zip code and hit “search.” By default, you will see the locations closet to you first. Zaycon’s default distance isn’t always “real world” accurate. The closest location to me (mileage-wise) actually takes me longer than another one, because of the traffic in the area. Be sure to look at several locations before deciding on one that fits your schedule. Pay attention to the pick-up times. You only have 30 minutes to pick up your order, and the time frames are NOT consistent across locations. The pick-up dates are at least one month and up to 5 months out. If you need meat sooner, head to the grocery store. 4. When you find something you like, click the “Purchase” button next to the CORRECT date/time stamp under the CORRECT location. 6. When you’re ready to check out, review your order INCLUDING the date, time and location. Even if you’re sure, be doubly sure. 7. Click the “Checkout” button and complete your purchase. The only hang-up I had with my order is that my delivery date was delayed. I picked the week before November, which I thought would be neat since we’re not big fans of turkey for Thanksgiving. I was looking forward to steak! But there was an issue with the shrimp and so my order was delayed until January. All in all, it was about a 6-week delay, and I completely understand that sometimes these things happen. At the same time though, I picked that particular date because that’s when it was good for my schedule. I had to pick between two dates when delivery was rescheduled, and while I was able to go to one of them, what if I couldn’t do either? What if I had planned on using those steaks and shrimp for Thanksgiving, Christmas and New Year’s dinners? What if the only date I could pick up was when we were going to be out of town? This wasn’t a deal breaker, but it did make me pause. If I’m planning ahead and buying in bulk to save money, it doesn’t really do me much good if the company doesn’t deliver when they said they would. 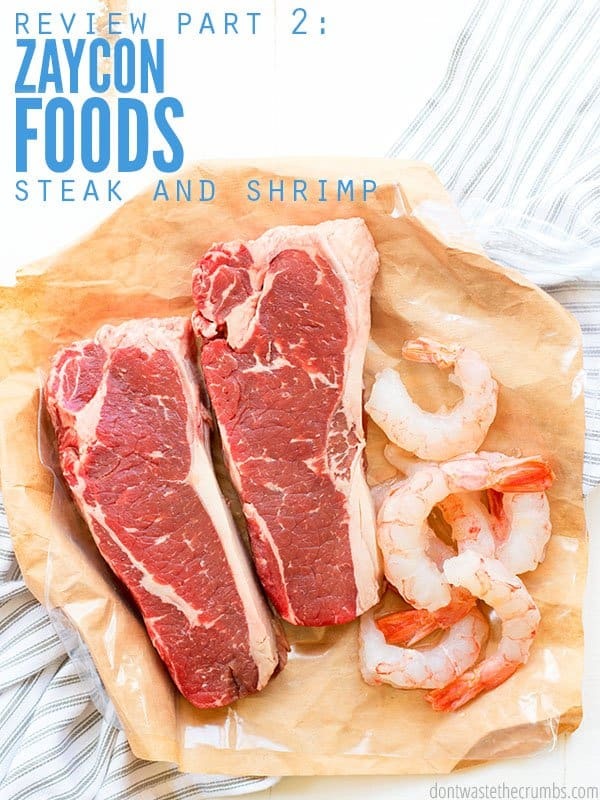 Like my first experience with the chicken breasts, picking up the steaks and shrimp was incredibly easy and convenient. I drove to the location, rolled down my window and gave the attendant my last name. He put two boxes on my front seat, wished me a great day and that was that! I didn’t take video of my pick up this time around, but you can watch it in real-time right here. UPDATE: As of June 25, 2018, Zaycon Fresh has suspended operations. Read the details below! Each steak weighed 12-14 oz** and came came individually wrapped in one large box. This was much more “user friendly” than my chicken breast experience. The chicken breasts came attached together, and there were 10 pounds worth in one bag. It only took 45 minutes or so to cut them apart and place in freezer-safe bags, but not having to do any leg work at all is a win in my book. I literally opened the deep freezer, put the box inside and went back into the house. Actually, I asked my husband to do that for me, but you know what I mean. The first official meal using Zaycon’s steaks was…. steak and potatoes. This is something we don’t do very often, but if you ordered a STEAK, and you’re testing it to see if it’s any good, then you have to at least cook it as a steak, right? So that’s what we did. We cooked up 2 steaks on our cast iron skillet (we have this one), put a pan of roasted potato wedges in the oven and whipped up crispy broccoli. The verdict: The steaks were delicious. 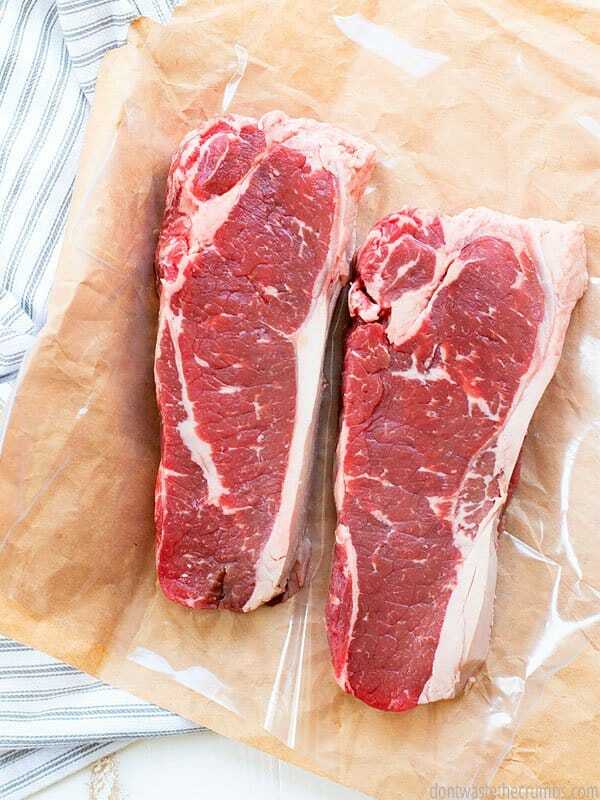 By nature, the strip steak is a middle of the road cut of beef. There tends to be some marbling of fat, which is normal, but that fat can be chewy. With the exception of the outer strip of fat (which again, is normal), the Zaycon steaks weren’t excessively fatty . They were tender, juicy and evenly marbled all the way through. My husband is the biggest critic after the boneless chicken breasts fiasco, and he gladly gave the steaks two thumbs up. We also tested them several times in making tacos and Instant Pot beef and broccoli (by the way, this is the Instant Pot I have, this is how it saves me money and if you’re interested in an Instant Pot, be sure to read this article first). 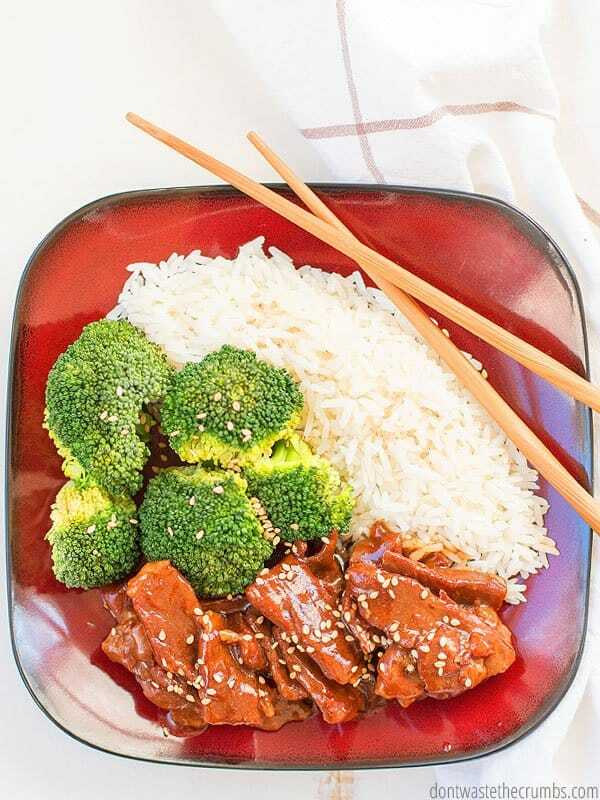 I did not use them in a slow cooker, since fattier roasts (like classic slow cooker pot roast) tend to fare better in the low and slow cooking methods. I also didn’t test them in the oven, since we’re not fans of how oven-cooked steaks turn out. The only downside to these steaks was that they disappeared fast. Perhaps it was the recipe testing, but we really liked these steaks and were sad to see the bottom of the box. ** I can’t remember exactly how much they weighed, and since they’re not available in my area right now, I can’t look them up on Zaycon’s site. However, the steaks were EITHER 12 oz OR 14 oz. The shrimp came cleaned with the tail on, packaged in 10 bags with 2 pounds of shrimp in each bag. Like the steaks, this was pretty convenient. We simply put all the bags of shrimp in the deep freezer and called it done. Worthy to note is that the shrimp were flash frozen, which is different than the steaks and the chicken breasts. Since the shrimp were flash frozen, thawing them meant the shrimp sitting in water for a period of time. This meant that the kitchen area smelled like seafood for awhile. This may or may not be a big deal, but it’s something worth noting. I just put Purification* essential oil in my diffuser and that did the trick. I should note that the bag says to NOT thaw at room temperature, but let’s get real – that’s how I thaw meat. Typically, I pull it out of the freezer before bed and put it in the kitchen sink. Besides, my fridge is on the small side as it is, and it’s currently jam-packed with fresh produce thanks to the Whole30. 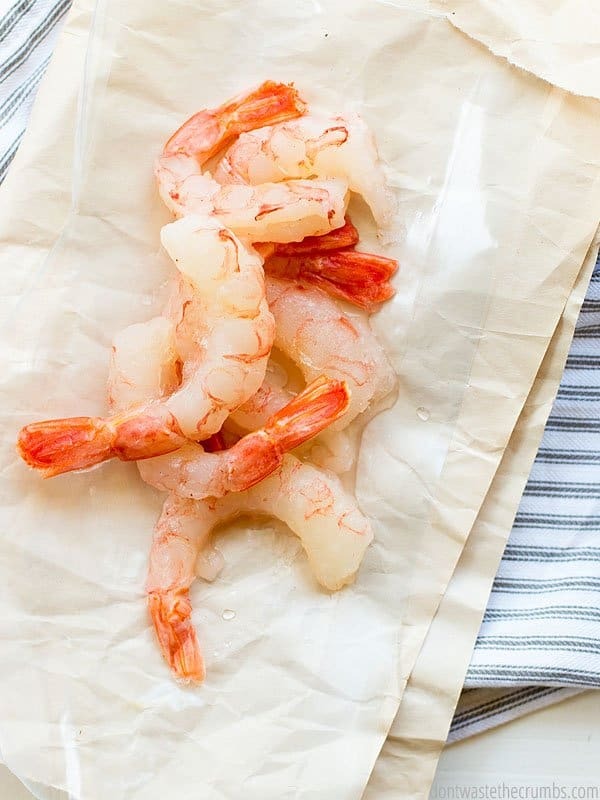 Putting a 2lb bag of shrimp, wrapped in a towel, on a shelf, just isn’t going to happen. Thawing aside, we always took the tails off when we ate the shrimp. Getting the tails off was a pretty easy endeavor, whether you pinched them off or broke them off. This is a big deal, because I’ve handled shrimp where getting the tail off without breaking the shrimp into tiny pieces was a massive endeavor. This wasn’t the case with Zaycon shrimp. The tails quickly and easily came off. * I know there are a lot of essential oil companies out there and I’ve certainly tried my fair share of brands. But after testing and researching and more testing, only one is worth spending money on (in my opinion). For a couple years now I’ve been committed to Young Living oils, and you can read more about their oils and my decision HERE. The biggest difference between Zaycon shrimp and shrimp we’ve had in the past is that Zaycon’s shrimp was tender. I know this might sound weird, but I didn’t realize how tough the shrimp I had been eating was, until I tried Zaycon’s shrimp. The only way I can describe it, is that it’s incredibly soft and tender (and yes, I made sure to cook it all the way through, LOL). Most nights we cooked it up in the cast iron skillet with either butter (pre-Whole30) or with coconut oil. 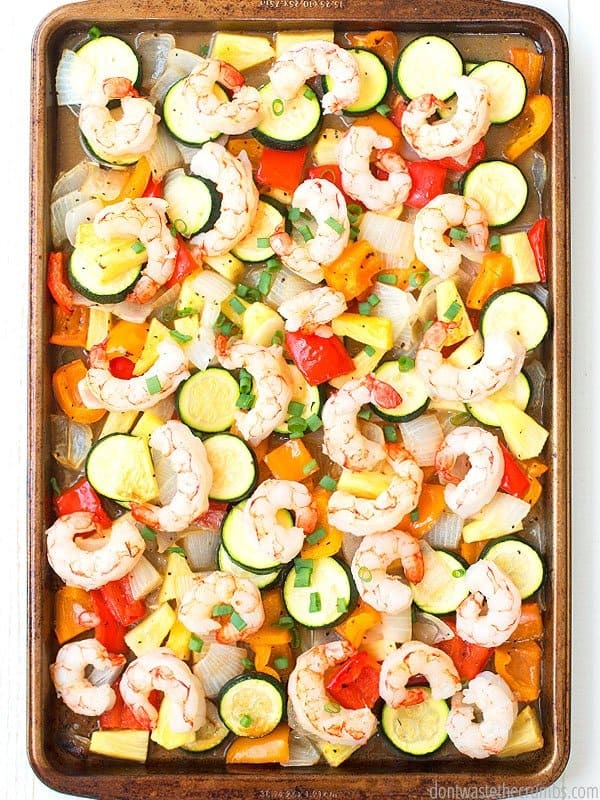 Our most recent “recipe” would be sheet pan Hawaiian shrimp, which is one of our favorites. We still have a few bags of shrimp left in the freezer, so we didn’t go through these as much as the steaks, but they also got two thumbs up from the family. It’s also nice to have something else for dinner besides the standard chicken, pork and beef. My husband struggles with anxiety that we believe is related to gut health and/or vitamin deficiency. In order to overcome this, the quality of our meat needs to have a greater priority. Right now, in our current season, buying from Zaycon doesn’t support our real food goals. The shrimp contained preservatives. The official ingredient list of the shrimp is: shrimp, water (as a protective glaze), sodium metabisulfite, sodium citrate (as preservatives), and citric acid (to maintain color). I haven’t researched these preservatives yet, but if I’m buying “fresh from the farm,” why are preservatives needed? This also makes me wonder if the steak and chicken had ingredients listed on the packaging, but I just missed it thinking there wouldn’t have been a list in the first place. While we won’t be making a purchase from Zaycon Fresh anytime soon, that doesn’t mean you shouldn’t! Zaycon offers quality meat for bulk pricing. A good portion of the meat in grocery stores has additives of some kind, and if that’s what you’re buying because that’s what you can afford, then Zaycon is a legitimate option for you. Zaycon Fresh often has coupons for their products too. Most recently there was a coupon for 20% off bacon, wings and cod. When you combine their coupons with their already competitive prices, you really can save a lot of money versus shopping at the grocery store. To be notified of sales, subscribe to their newsletter or follow them on social media. Last week, Zaycon suddenly shut down without alerting customers or blogging affiliates (like me). No emails were sent out and their website is not providing any information. As an affiliate with Zaycon, I am often given information ahead of time, but received no word about this shut down. All of my personal links to access my Zaycon account are giving me an error message which means I will not receive payment for referrals either. It is unknown at this point whether Zaycon will file bankruptcy and reopen business at a later date. This makes me so sad because they seemed to be doing so well with their business and I was ready to order some more shrimp and steak! While the prices that Zaycon offered were so amazing, it may be what lead to their undoing. Sadly, even their truck drivers were unaware that they were losing their jobs until the day of. Some finished out their deliveries for the week (without pay) to ensure customers received their orders. Current customers are encouraged to contact their credit card, Paypal, or bank to dispute the charges for any outstanding orders. Unfortunately this isn’t a guarantee to get your money back, but it is worth trying. Local farms will most likely have the best quality for the best price in your area. Go here for help finding a local farm in your area. If you can’t fit a whole side of beef in your freezer, consider going in with some friends and splitting it up. Have you ordered from Zaycon Fresh before? What did you order, and what was your experience? I learned so much from reading other people’s experiences, so please leave yours in the comments below! Thanks for another review of Zaycon! I’d been wondering about their other products. As for the shrimp, luckily we live within 5 hours’ish of the gulf coast and there is a guy here who trucks fresh caught seafood from the gulf to his store every other day. No preservatives, to my knowledge! I’m with you on the not purchasing from Zaycon for a while, I’m in the same camp. I’ll have to see way more positive reviews of the other products before I commit to that again. I just placed my first order for Zaycon chicken breasts and will pick them up in mid-June. I, like you, have heard so many good things about them. I was reassured by your first post that if I get bad chicken, the company will make it right. Although I’m really hoping the chicken is good! And I’m also hoping I have enough room in my freezer for it. I am working on eating it down currently so that we’re ready for it! I hope you like it too Colleen! I bet you’ll have enough room once you split them and re-package. The chicken breasts stack nicely (once frozen, LOL). I am sensitive to sodium metabisulfite (it’s different than an allergy) and it makes me violently ill for about 12 hours after ingesting. It took me a long time to figure out what I was reacting to because I had no idea it was commonly used to prevent shrimp from turning black. One day, I saw a sign in the fish case at the grocery store that the shrimp may contain this preservative. This, after years of purchasing it from fish counters where there was no notification whatsoever that this was in my food! It was very disturbing, to say the least! I previously thought that I couldn’t eat shrimp but now I know I can eat shrimp as long as we catch it ourselves. I don’t trust any other shrimp, even the stuff that is supposedly locally fresh caught. We just picked up our first box of chicken this past week. It was actually some of the most tender chicken I’ve had in a good while. I’ve purchased individual breasts and value pack sized packages from grocery stores, bulk boxes from butchers and from family farm stores and raised our own meat birds. (Large family -11 children, so bulk buying is often my preference.) My one daughter said the same. She used her instant pot and it was great. They even felt different when slicing the raw meat. I’ve used it twice now, in the crock pot the first time, cubed in a skillet the next. What makes it even tastier is that I used a first time buyers discount so paid just over $30 for the 40 pounds. I really appreciate your thoughtful way of presenting your reviews. Zaycon has been a loyal place we do our meat shopping! We’ve ordered from them for years!! In the past we’ve loved the chicken!!! However this last order (several months ago) was not up to what we had in the past! Chewy meat was the issue as well! Bacon is our all time favorite tho!! We never buy bacon anywhere else! The shrimp has a strong taste to us and every time I ate it I had stomach issues. This only happens with the Zaycon shrimp. I love shrimp and purchase it elsewhere now. We have not tried their other products. Yuck on the sodium metabisulfite and citric acid. We have a corn and sulfite allergy over here. You’re the only blogger that had the same problem with the chicken I did.It was the worst. Thanks for your honesty.I have wanted to try something else from them ,but haven’t because the chicken was so bad.I may try it now . 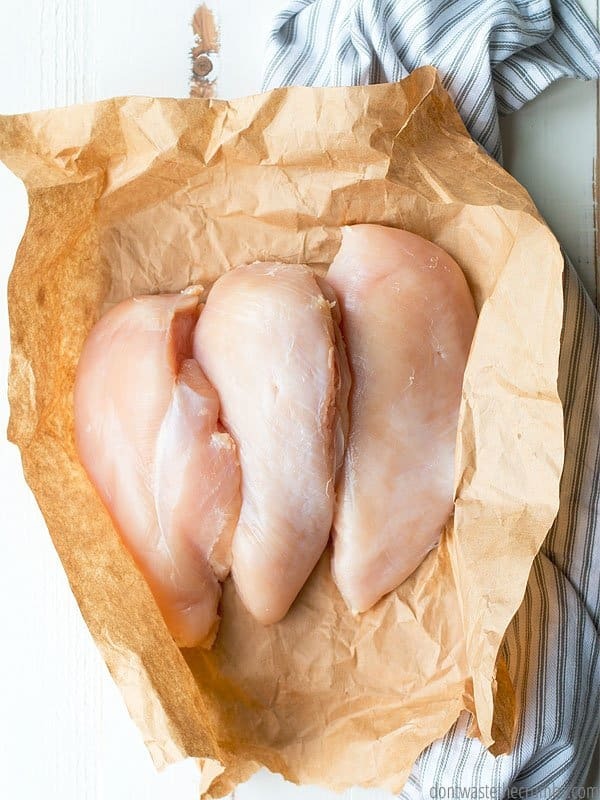 I’ve been ordering chicken breasts from Zaycon for a few years and only on my December 2017 order did I have any issues with quality, but it wasn’t the whole batch, just a breast here and there. Occasionally we’d cut into a tough, rubbery bite. Ground turkey tastes good, but the texture is strange, and we’ve found a number of bone fragments. I won’t order it again. I’ve ordered ground beef a few times. Previously it was sold in large tubes, maybe 10lb, that I’d break down and repackage. My last order in 2017 was prepackaged in 1 lb vacuum sealed blocks. It tastes great but seems fattier than 93/7 as it was labelled. Also, the packages tear easily, losing the vacuum sealed. Worst chicken I have ever tasted. Before I threw the other 30+ pounds away ( yes it was that bad) I tried boiling some to make dog food. That was even too tough. Huge waste of my money. Prepaid for my chicken order in may for delivery Oct\2018. Should have known it was to good to be true. What a pain! Lesson learned the hard way, I guess. am disappointed that my $116 is gone. I contacted my bank and there is nothing that bank can do because it was over 60 days. WAS A ZAYCON CUSTOMER FOR YEARS AND ALWAYS HAPPY WITH WHAT WE PURCHASED. HOWEVER IN THIS YEAR ALONE, THEY TURNED INTO A TOTAL RIP OFF. THEY WERE TAKING ORDERS FOR PRODUCT THAT THEY HAD NO INTENTIONS OF DELIVERING AND UP TO THE DAY BEFORE THEY ANNOUNCED THEY WERE SUSPENDING BUSINESS. TOTAL FRAUDULENT BUSINESS PRACTICES. WE WERE ABLE TO GET BACK SOME OF OUR MONEY BUT NOT ALL. FRAUD CHARGES SHOULD BE LODGED AGAINST THEM. I NORMALLY DO NOT WISH BAD ON ANYONE, BUT IN THIS CASE I HOPE THEY ROT IN _ _ _ _!!!!! SO MANY PEOPLE LOST THEIR HARD EARNED DOLLARS IN A SCHEME THAT ZAYCON THEMSELVES PRODUCED AND CARRIED OUT. THE ORIGINAL OWNERS HAVE FILED BANKRUPTCY PREVIOUSLY FOR ANOTHER COMPANY AND THEN STARTED ZAYCON.